I was not even two years old when little sister entered my world shattering my monopoly in a large joint family! When I was born, my first cousin was in his mid-twenties while the youngest one was in his late teens. So it was not difficult for a chubby baby girl with jet black hair and cheeks that resembled a generous sized Idli to make every other person in our family to dance to her tunes just by shaking her little fingers. 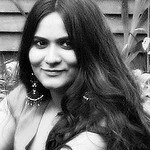 I was pampered and a spoilt brat who had many people falling on my chubby feet for the first 22 months of my life. And then my exclusive control on everyone’s attention and being centre of everyone’s universe came to sudden halt! I had a new rival in a form of wriggling bald headed new born who had chubbier cheeks than my own! All she needed to do was cry out loud and all the women in our family along with my Amma were seen leaving all their work and running to pacify this creature. I was angry and jealous and wanted my Amma to send her back to the hospital where she was supposedly picked up by parents as my playmate. This creature with wrinkled face and loud voice was driving me nuts with all the attention she received from everyone and became the new attraction to every guest who came bearing her presents. I guess that’s when I experienced the sibling rivalry for the very first time! :) But it didn’t take her a long to make me dance to her tunes. She became my pet, and some days a pest, with her antics. I can’t remember when this little girl with her large puppy eyes twinkling with mischief became my partner in crime and my best friend for life! But it was a different story when our little baby brother entered our world. Our joy had no limit when our parents called their 6 and 4 year old daughters and prepared us well for the arrival of new addition to the family. I wonder if it was the prospect of having living and breathing baby to play must be the reason for our excitement! The baby of our family who was born on a beautiful spring day is the greatest blessing for two little girls’ prayers. Wrapped in a white soft cashmere shawl, the red cheeked and pink lipped baby with head full of thick black hair was the most beautiful baby I have had ever seen. It was love at first sight, a love like no other! This brother of mine became my first baby and I became more of a mother to him than a big sister from day one! I share a very special bond with my two siblings. My sister is my most beloved friend and on some occasions she is my bitterest rival. She is my confidant and my betrayer. She is my safety net in the chaotic world and my best friend whom I can never get rid of. :) She is everything I wish I could be and everything I wish I wasn’t! She is my equal and yet she is my polar opposite! My brother on the other hand is my baby who had me wrapped around his little pinkie finger from the day I first laid my eyes on him. I don’t remember having any sibling rivalry with him as I did my sister. I have more of a maternal love for him than sibling love that I share with my sister. I always protected him from our parents’ wrath whenever he got into trouble because of his never ceasing pranks and mischief. He was my baby, always my baby, whenever we role played with our friends and cousins. As a little boy he would patiently sit and let me cover him in makeup and girly cloths! He was my arm candy and I would proudly show off this chubby little butter ball with dimpled smile to all my friends in school on special days where the school allowed the kids to bring their younger siblings. Before he grew those big muscles and double my height, we had some pretty good wrestling matches; I always won. :) The little boy who changed my world forever means the world to me. Today that little brother of mine is getting married to the love of his life and I couldn’t be happier for them. A boy from South India and a Bong girl from East India are tying knots that for a lifetime of love and equal partnership. It is a time to celebrate their love and friendship and what a better way to celebrate it than by cooking something rich and festive dish?! 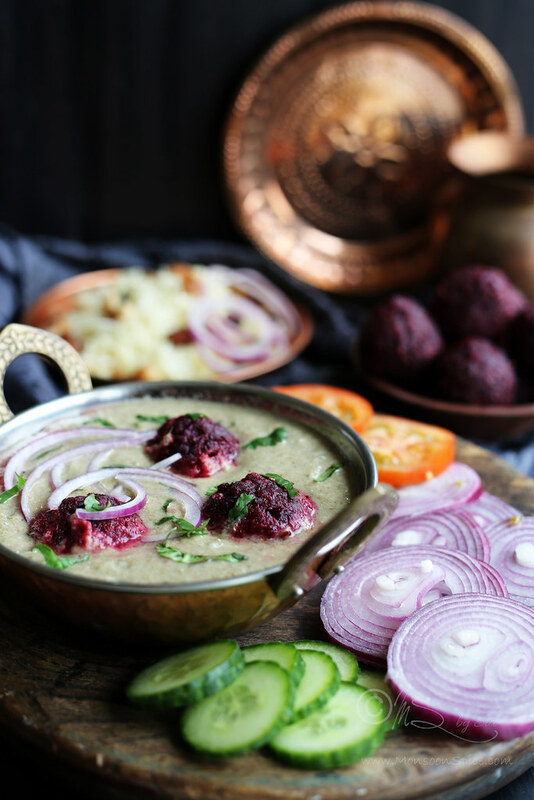 As I pack our bags and suitcases filled with our love and gifts for the family in India, I leave you with a recipe for Mughali Style Vegan Beetroot Kofta Curry. 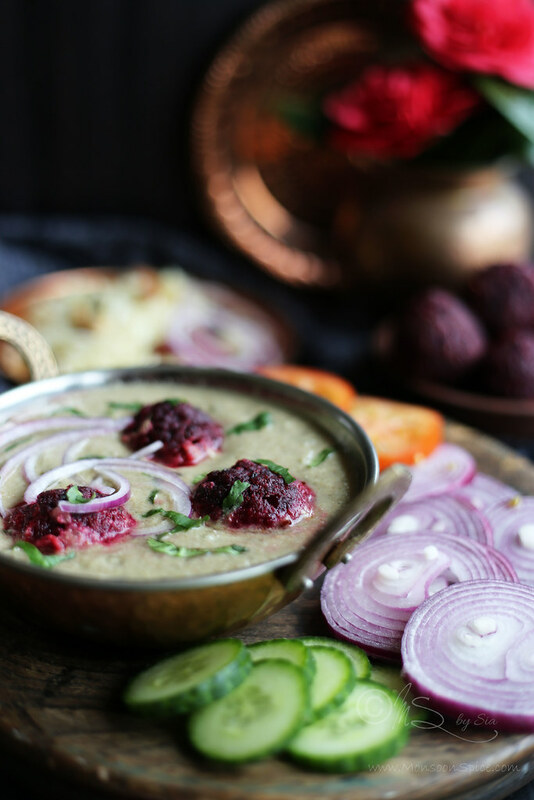 Deep fried spicy red beetroot balls simmered in rich creamy gravy of almond and cashew nuts is a perfect recipe to celebrate the love of young couple. 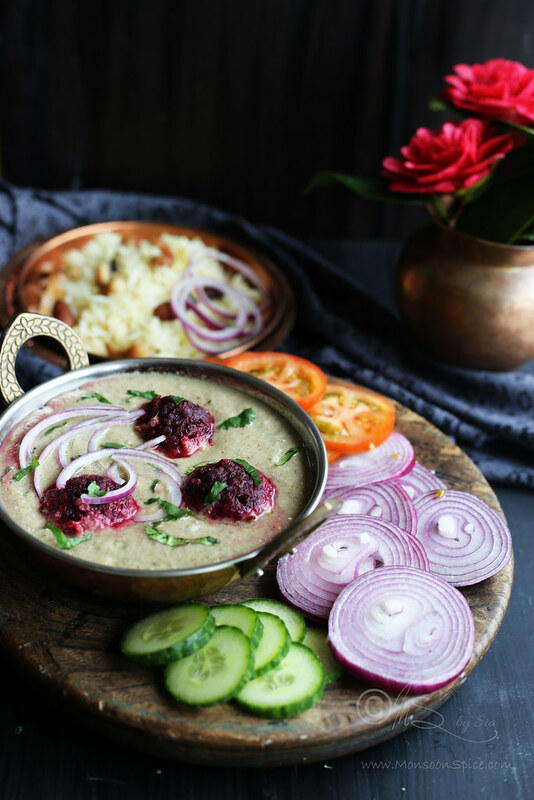 Please do bless the couple and wish them all the happiness in this world as they embark on an adventurous journey of their lives and join the wedding party with this delicious bowl of Vegan Beetroot Kofta Curry. Heat 1 tbsp. of oil in a pan on medium flame and add cassia stick/cinnamon, cloves, green cardamoms, star anise, black peppercorns and bay leaf. Fry the whole spices for a minute. Next add finely chopped onions along with sugar and a generous pinch of salt and sauté until they turn golden brown, about 2-3 mins, on a medium flame. The sugar helps in caramelising the onions and the salt helps to quicken the cooking process. Add ginger-garlic paste and sauté until the raw smell disappears, about 2 mins. Turn off the heat and let the mixture cool down a little. 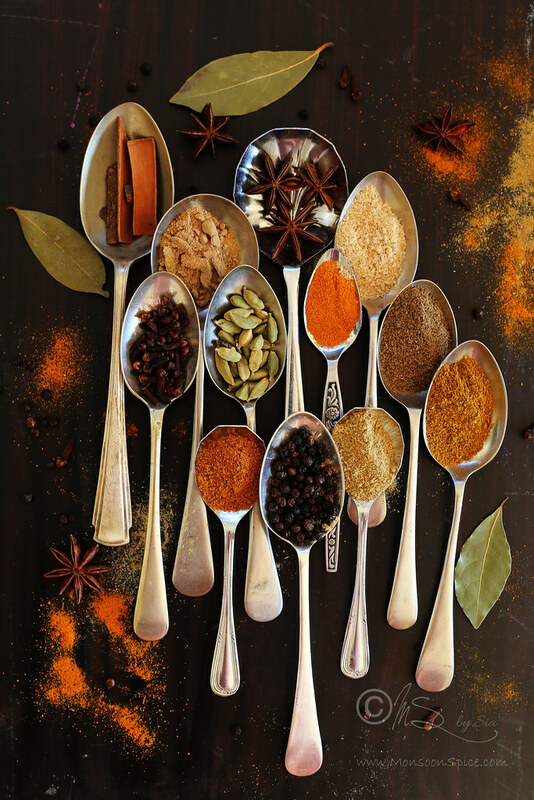 Transfer the fried whole spice and onion mixture into a food processor or mixer grinder. Drain the water (and preserve this water) from the soaked almond and cashew nuts and add them to the food processor. Grind the mixture to smooth paste by adding the preserved water little at a time. Keep it aside until needed. Heat 1 tbsp. oil in the deep frying pan on a medium flame. Add cumin seeds and fennel seeds and fry them until the cumin seeds sizzles and changes colour to a darker shade, about 1 min. Add the ground cashew-almond paste and fry it on a medium flame for 3-4 minutes stirring continuously. Add about 1-1½ cups of water (depending how thick you prefer the gravy). Cover and let it cook for 4-5 mins on medium flame. 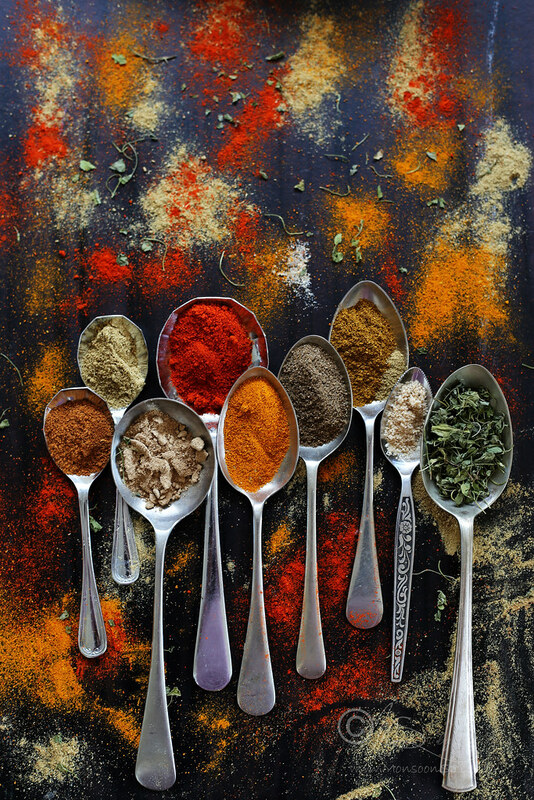 Reduce the heat to low and add the kitchen king masala, garam masala and crushed kasuri methi and mix them well. Adjust the seasoning and add little more water if the gravy is too thick and cook for another 5-6 minutes. Switch off the flame and mix in finely chopped coriander leaves. Boil or cook the whole potato in a pressure cooker. Once cool enough to handle, peel and mash the potato well. Wash, peel and grate the beetroots. Peel and finely chop the onions. Keep them aside until needed. Crumble the bread slices with hand or food processor and keep them aside. Heat oil in a pan on medium flame and add cumin seeds, fennel seeds and hing. Sauté until the cumin seeds sizzle and change colour to deep shade of brown. Mix in finely chopped onion and a generous pinch of salt. Sauté until the onions turn golden brown, about 2 minutes. Mix in ginger and garlic paste and fry until the raw smell disappears, about 2 mins. Add grated beetroot and fry it until most of the moisture evaporates and the beetroot is cooked, about 4-5 mins. Add turmeric, red chilli powder, cumin powder, coriander powder, crushed kasuri methi, kitchen king masala and garam masala and sauté for 1 minute or two. Turn off the gas and add amchur powder or freshly squeezed lime juice and salt to taste and mix them well. Let the mixture cool down to room temperature. Mix in mashed potato, crumbled bread and corn flour. Use hands when to mix all the ingredients and make sure they are mixed well. The consistency whole mixture should be as that of soft and sticky chapatti dough and you should be able to make lemon sized balls without breaking them. If the mixture is too wet or you find difficult to make kofta balls, add a tbsp. or two of corn flour and mix them well. 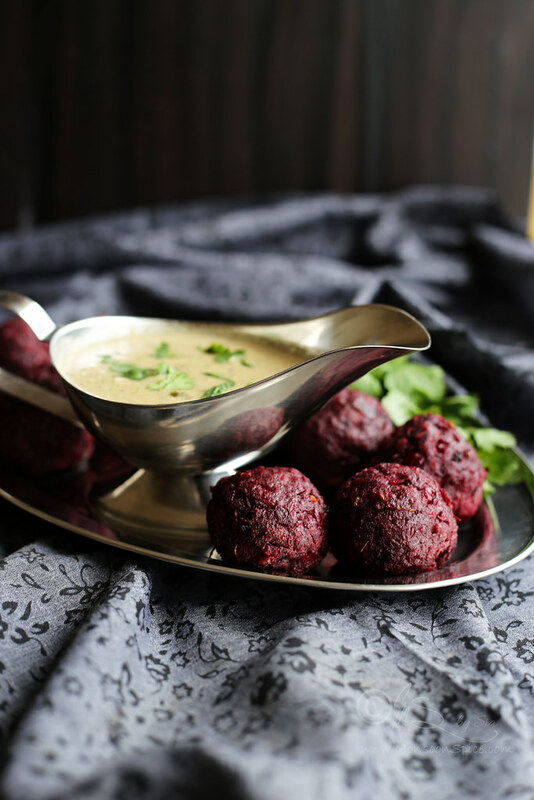 Alternatively, you can pop the mixture in refrigerate for 30-40 minutes which will help in firming up the mixture and aid in rolling the kofta balls. Heat oil for deep frying and reduce the heat to medium to low flame. When you deep fry the koftas, first make sure that the oil is hot enough before you place them for deep frying. To test if the oil is heated well, drop a small piece of kofta mixture. If it sizzles and floats to the surface of oil, the oil is ready for deep frying and if it sinks, then wait for couple of minutes before deep frying. Place one kofta at a time in a pan when deep frying. If the Kofta starts to break or crumble add about 1-2 tbsp of corn flour and mix well. Corn flour acts as the binding agent and will prevent the koftas from breaking when deep frying. Don’t crowd the frying pan by adding too many koftas. To get evenly cooked, perfect golden brown coloured Koftas, always fry them in a batch of 3-4 koftas at time. Fry them till they turn golden brown and crisp and place them in a plate lined with kitchen towel to absorb excess oil. Alternatively you can bake them in an oven at 180 deg centigrade for about 15-25 minutes or fry them in Appam Pan with little oil till they turn golden brown. Heat the gravy for few minutes and then transfer it to serving dish. 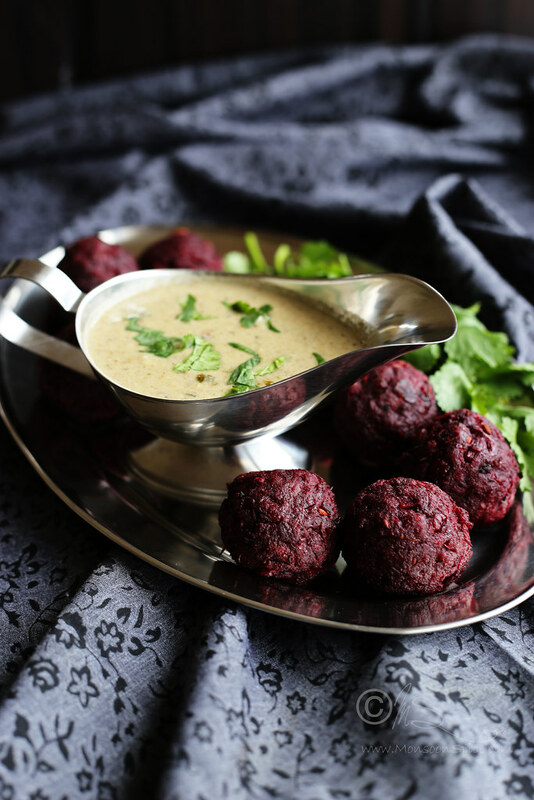 Arrange the koftas in gravy and top it with finely chopped coriander leaves. 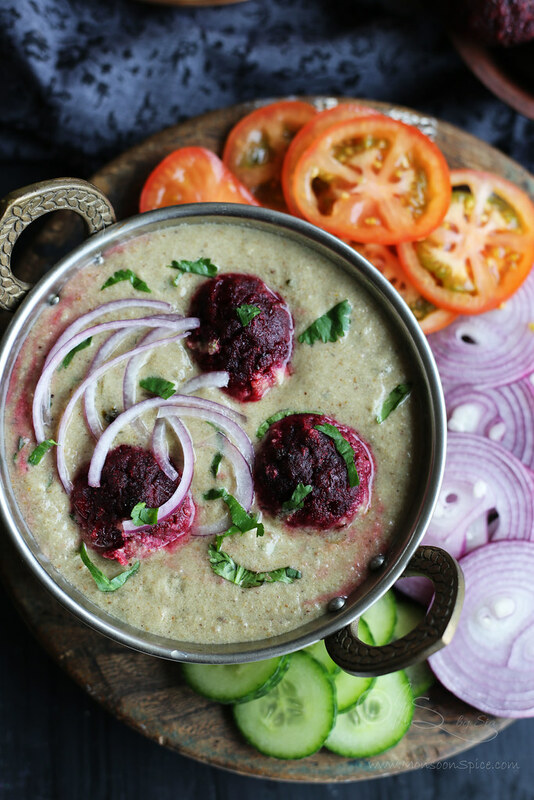 This Vegan Beetroot Kofta Curry tastes best when served with any Indian flat bread (I prefer naan or chapatti) or flavoured rice like saffron rice or jeera rice with slices of onion and lemon wedges. Enjoy! Use hands when to mix all the ingredients for kofta and make sure they are mixed well. The consistency of the mixture should be as that of soft and sticky chapatti dough and you should be able to make lemon sized balls without breaking them. If the mixture is too wet or you find difficult to make kofta balls, add a tbsp. or two of corn flour and mix them well. 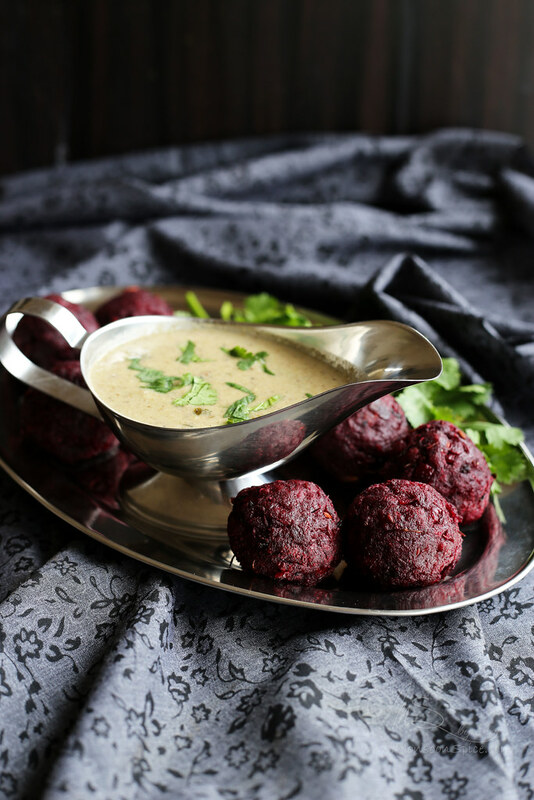 Alternatively, you can pop the mixture in refrigerate for 30-40 minutes which will help in firming up the mixture and aid in rolling the kofta balls. To test if the oil is heated well, drop a small piece of kofta mixture. If it sizzles and floats to the surface of oil, the oil is ready for deep frying and if it sinks, then wait for couple of minutes before deep frying. 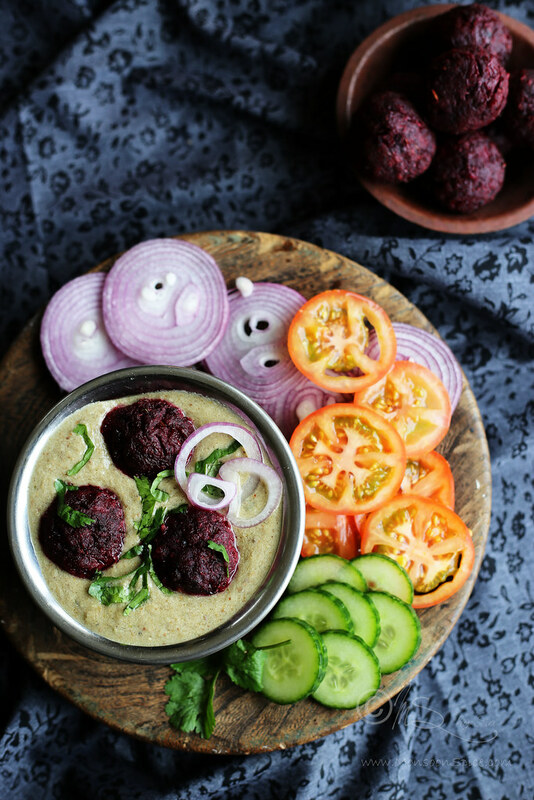 Always fry the koftas in low-medium flame so that they are cooked well and get lovely golden brown colour. Congratulations & Best Wishes to the couple and family ! Such a beautiful post Sia, Wishing your little brother and his bride lots of happiness!! The kofta curry looks scrumptious. Thank you, Shilpa for the wishes! Beautiful kofta/curry and pictures! I love beetroot and that kind of food. What a beautiful post! Everything from the idli faces to the moment when you know he is now a grown man on the brink of a new life... So many emotions ! And that recipe sounds great! Have to try it out! Kofta looks yum! Congratulations and Best wishes to your brother ! Dear sia was looking out for something interesting with beetroot. Thanks. Looks very good. Coming from u it won't disappoint. As usual the photographs just rock. Wishing the couple a very long and happy married life. !! Hi Sia, Interesting recipe with beeteoot. Love it! 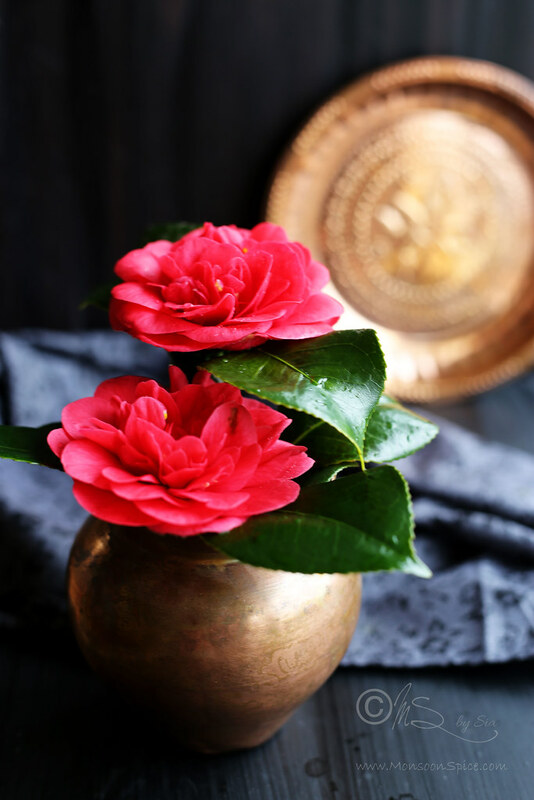 and First time here, Wonderful blog with great posts and stunning pictures. Congrats! 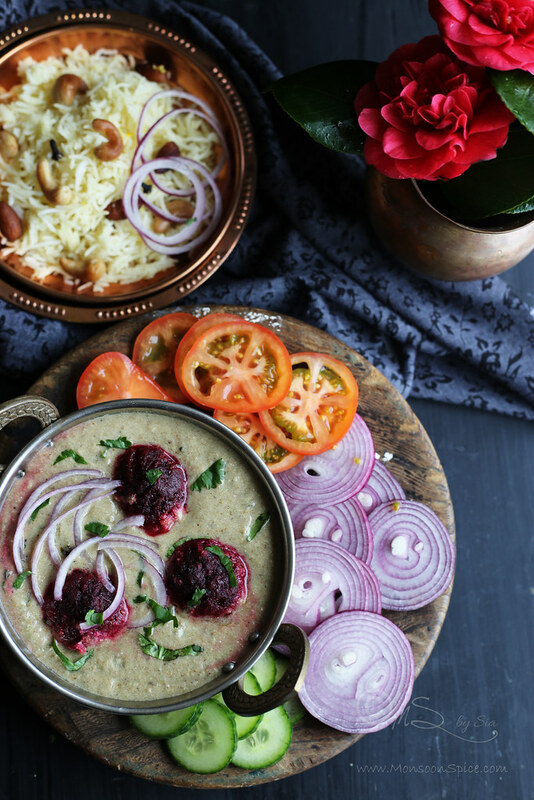 Wow such a mouth watering dish.Love the masalas used in it.